Hello welcome to Dortmund vs Real Madrid Dream11 Football Team Prediction, Fantasy Preview, Possible Lineups and Team News. Borussia Dortmund Will take on Defending Champions Real Madrid on September 27 at BVB Satidon Dortmund. Peter Bosz will be without injured Guerreiro (ankle), Schmelzer (ankle), Rode (ankle), Durm (hip) and Reus (knee). There are No doubtful players for Borussia Dortmund. Bürki; Piszczek, Papastathopoulos, Bartra, Toljan; Şahin, Dahoud, Götze; Yarmolenko, Aubameyang, Philipp. Navas; Carvajal, Varane, Ramos, Nacho; Modrić, Casemiro, Isco; Bale, Ronaldo, Asensio. Borussia Dortmund have scored 16 goals, while Real Madrid have scored 18 goals. Borussia Dortmund won 3 matches and Real Madrid won 4 matches, while 5 matches were drawn. 1. Borussia Dortmund have scored at least 3 goals in their last 3 matches in all competitions. 2. Real Madrid have scored at least 2 goals in 12 of their last 14 matches (UCL). 3. Real Madrid are undefeated in 25 of their last 28 matches (UCL). 4. Borussia have scored at least 2 goals in their last 4 home matches against RM in all competitions. 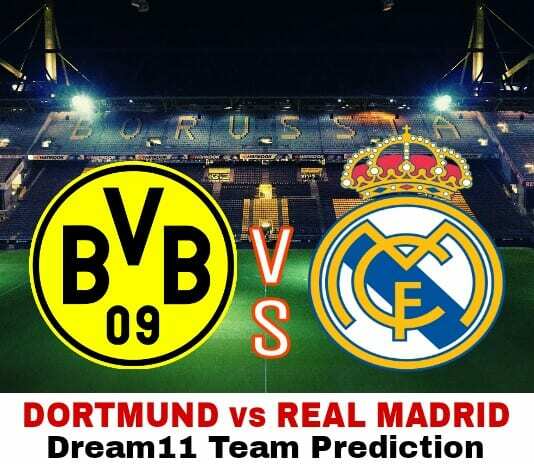 Dortmund vs Real Madrid Dream11 Football Team Prediction. Both teams are good, so a fight match will get to see. If you want to take Isco then First of all, You will have to maintain credit for this. Therefore Remove Ramos by Varane in Defenders. Then you have able to take Isco in place of Modric. In Champions League Lineups are 99% out before Deadline so Check their offical twitter account 10-20 minutes before Deadline. For this you can also follow us on Twitter. If you liked this article Borussia Dortmund vs Real Madrid Dream11 Football Team Prediction, then please subscribe to our Email Newsletter For Latest cricket News, Fantasy Previews, Playing XI and All information about Dream11 Fantasy Football. You can also find us on Google+ and Facebook.